When creating a Mandatory Profile any registry changes made by software will get saved back and used by everyone. Generally this is great as you can do things like switch off start-up dialog boxes, etc. 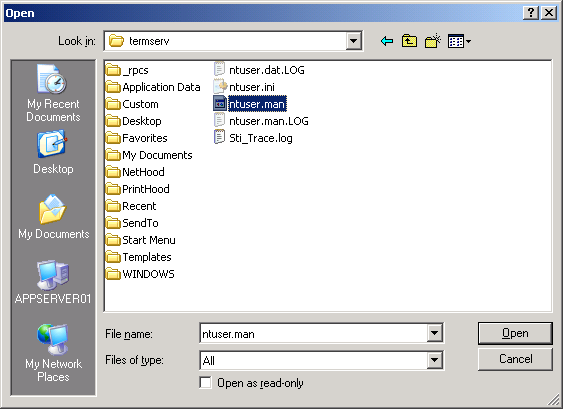 Unfortunately, some software creates folders in the profile and then saves the paths in the registry. A prime example of this is software by Serif. If you never run the software as profileuser, then it will work for everyone. 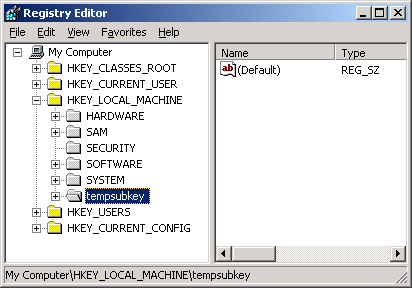 However, once it is run as profileuser, then paths such as C:\Documents and Settings\profileuser\Application Data\Serif are saved in the registry. If another user (i.e. not profileuser) then loads this profile, the software will attempt to use the path already in the registry instead of a new one and that path is not accessible by any other user except for profileuser. This means you get errors when starting the software. Precedence Technologies has released a little program called regsearch which can fix this. It can be downloaded from here. Download regsearch from the Precedence download website. Click on Start then Run..